On the next bloc after Villa Cicurel stood Villa Ihamieh the residence of Princess Hourieh Mahmoud Hamdi and her stepdaughter the dour Princess Mounira. The intolerance of Khedive Ismail's granddaughter was matched only by her peculiar physique for Mounira was short, squat and a hunchback. A story making the rounds at the time claims how during one of the frequent parties given by a well to do neighbor, Princess Hourieh picked up her gun, nipped over to the clamorous party and shot the host. Luckily for him, the princess was a poor markswoman. Unlucky for Mounira was that besides his being the distinguished MP from Mineh and a close relation of Madame Hoda Sha'arawi, Egypt's leading feminist, the intended victim, Mohammed O. Sultan Bey (later pasha), was President of the Royal Automobile Club whose principle patron was Mounira's august cousin, King Farouk. And King Farouk only liked beautiful women. It appears the gun-totting princess was equally alert during WW2. Passersby occasionally glimpsed her squatting in her balcony shotgun in hand waiting for the presumed enemy to arrive. In the 1970s Villa Ilhamieh made way for two skyscrapers and the building where Sultan Bey gave his rowdy parties was recently replaced by a multi-million dollar semicircular glass and concrete Shangri-La. Bordering University Bridge's north side stands Villa Saab surrounded on both sides by nurseries and gardens. Although little is known of the de Saab's lifestyle, they are credited for producing the renown French author Andrée Chedid born Saab. After being briefly occupied by the Chourbagui family -- Syrian textile barons, Villa Saab is now the Embassy of Lebanon, but not for long. Next along, came the villa of Alexander Green, one of the sons of Solomon Green whom we met earlier. Alexander built his house circa 1930 on Ibn Malek Street (No. 5). Designed by Egypto-French architect Max Edrei (changed from El-Deri, a common Jewish name) the villa fronted the Nile alongside that of Sir Robert Greg. It was bought by the government in July 1956 and demolished in order to allow for the Bridge from Rhoda Island to the university to be built. On the south side of University Bridge stood the villa of Sir Robert H. Greg (No. 8 Ibn Bakil Street), the British Commissioner at the Caisse de la Dette -- a financial organization set up by the European Powers soon after Khedive Ismail went bankrupt. Next to Sir Greg was the villa of Wissa Wassef Bey. The Wassefs are gone but the street bordering their now defunct villa bears their famous name. In the 1920s the Wassefs played an important role in the creation of the Wafd Party, described in those days as the repository of bourgeois Egyptian nationalism. Both villas -- Greg and Wassef -- were replaced by skyscrapers. Borg al-Riyad belongs to a Saudi royal and houses the famous Alpha supermarket. Parallel to Wissa Wassef Street and perpendicular to the Nile is Ibn Arhab Street on which still stands the mansion of Dr. Ahmed Shafik Pasha. The adjoining garden which had seen better days when the entire estate belonged to Hussein Riaz Bey, son of former prime minister Mustafa Riaz Pasha. It is there in Spring 1934 that the Royal Language Institute was first headquartered.The said estate was gradually eradicated replaced with a collection of tall buildings the last one appearing in the 1970s practically atop the Shafik villa. A sorry sight if there was any. Meanwhile, the contiguous villa belonging to Shafik Pasha's neighbor, Naguib Youssef, has been replaced by the Embassy of the United Arab Emirates. Villa Kazima was subsequently acquired by the Republic of Turkey as a residence for its envoys. 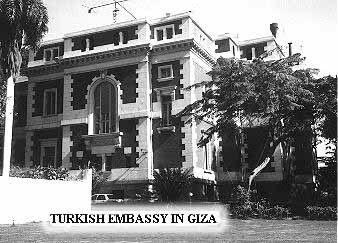 In the late '40s and early '50s, the Turkish Embassy residence was home to Ambassador and Madame Fouat Tugay. Through her mother Princess Nimet Mokhtar, Emina Tugay was a granddaughter of Khedive Ismail and therefore a direct cousin of both King Farouk and the late Princess Kazima. In a sense, the house had reconnected with Egyptian royalty. But not for long, for the Tugays' were the dejected witnesses to the toppling of King Farouk before being themselves thrown out of Egypt. 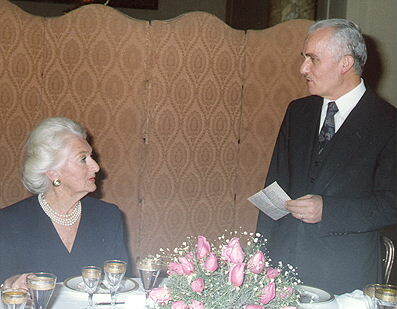 Nasser had taken a distinct dislike to the patronizing Turkish ambassador and his outspoken wife. Relations with Turkey remained at an all time low several years thereafter. Today, No.2 Ibn Sina Street is the residence of Ambassador and Mrs. Yasar Yakis. Yasar Yakis or "Yasar Bey" as the ambassador is known in Cairo, is one the ablest representatives of his country ever to have served in Egypt. Surrounded by a large garden his official residence ranks amongst the most elegant embassies in the nation's capital. Its inimitable marble escalier d'honneur is second to none. Across from the Turkish Embassy, standing back to back on the southern side of Ibn al-Gesm street stood the two villas belonging to Mohammed and Abdelhakim Marzouk, large landowners from Minieh married to the daughters (Aicha and Mounira) of Ali Sharawi Pasha, the long-time senator from Minieh. Along with their Sultan relations both these clans produced several senators and deputies who represented Minieh in the Egyptian parliament all claiming direct ancestral lineage to the prophet's tribe in the Hedjaz. While Mohammed Marzouk's redbrick (sornaga) villa disappeared in the 1980s following its sale by his heirs to Sheika Moudy al-Ankari from Saudi Arabia, his brother's three-story villa, No.36 al-Nil Street fronting Ibn Nouf Street, stands out as a resounding example of 1930s art-deco architecture with its interiors designed and decorated by Armando Centofanti. How long this villa remains extant depends on its current owner, the government of the Gulf Emirates.